Download Our Free Mobile Application for Your Smart Device! The Irwindale Police Department is committed to building strong relationships with the community in order to improve public safety. In addition to our core service philosophy, we strive to find new and innovative ways to connect with our residents and businesses. As such, we are proud to present our mobile device application. In the event of an emergency, mobile application users may receive an instant notification alerts from the police department directly on their mobile device using push technology. The mobile application also allows the police department to post information of interest about the police department, including photos and images, contact and social media information, crime bulletins, traffic alerts, a calendar of events, and even conduct community surveys directly to the user's mobile device. 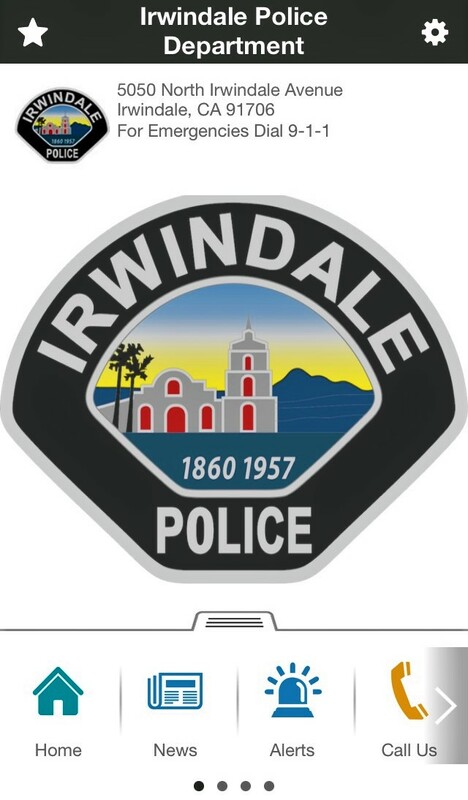 We encourage all of our citizens, our business community, media outlets and anyone with an interest in the Irwindale community to download our mobile application to stay connected and interact with the Irwindale Police Department! Mobile Application Features and Uses! Download our Mobile Application from your Provider's App Store! The Irwindale Police Department mobile application is available for smart devices (such as cell phones, tablets, etc.) that use iOS (Apple), Android (Google) or Windows Mobile operating systems. Once installed on your mobile device, click on settings by clicking the gear-shaped logo in the upper left corner of the application's main window. You can then tailor the application's setting to fit your personal preferences by setting your notification, profile, message, data sync and view preferences. 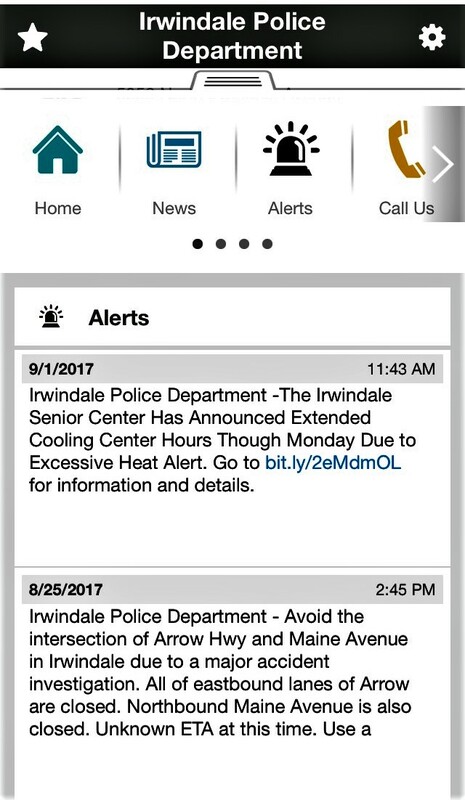 Use of the Irwindale Police Department's mobile application is not intended for emergency notifications to the police department or emergency communication with law enforcement agencies. It should not be used for situations where immediate response is required. Always dial 9-1-1 in an emergency situation. Non-emergency requests for police services should be made to the Irwindale Police Department at (626) 962-3601. The applications is free and does not compromise privacy. The application does not collect any personal data and no personal data is shared with the Irwindale Police Department.